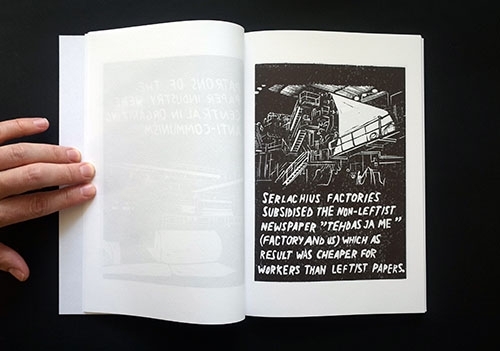 Rab-Rab Press is an independent discursive platform based in Helsinki. It publishes annual Rab-Rab: journal for political and formal inquiries in art, and special publications advancing non-institutional thought. We are against using art as a pretext for a fictive triumph where "in the end, everything always works out" (Brecht). So far we have published six numbers of the journal on the special topics of language, noise, forest, and remembering as future; artist's book with linocuts on political history of paper industry in Finland, pamphlet on Zaum poetry, and the translation of Viktor Shkolsvky's children's book on cinema; and organised talks by Ben Watson, Rasha Salti, Michael Corris, and Jacques Rasnciere in Helsinki. Currently, Rab-Rab Press is working on the research and publishing project called 'The Forms of People's Revolt' which will result in a series of publications. The upcoming publication 'Coiled Verbal Spring: Devices of Lenin's Language' including first English translation of Russian Formalist and Futurist experimental texts on revolutionary language will be presented at Bookies.